"Thank you for a very powerful, reflective day; intense, emotional at times. Has provided me with clarity around my values, strengths and future focus. But also, not to put myself under pressure to do it all at once!" "Thank you! The combination of coaching and mindfulness is great." "It was an amazing opportunity -- greatly enjoyed it and helped me to recharge and set new goals in my life." Gather with a small group of no more than 8 women together with life/career coach, Jen Walper Roberts of Conspire Coaching and Suzie Shenderey, hypnotherapist and mindfulness trainer. Nourish yourself in a calm, supportive and peaceful space, in-tune with the autumn season. The retreat combines coaching, mindfulness and meditation activities - a careful balance of being and planning. You will work with all of your senses. Please email jenroberts@conspirecoaching for more details and to register. "I would highly recommend this retreat!" "Thank you! You've achieved something really, really amazing today!" Now open for registration: We've heard loud and clear that there is a need for shorter-term/ high-impact coaching programs for those of you who have completed Women Leaders Emerging (or who haven't been able to commit to the multi-month curriculum). 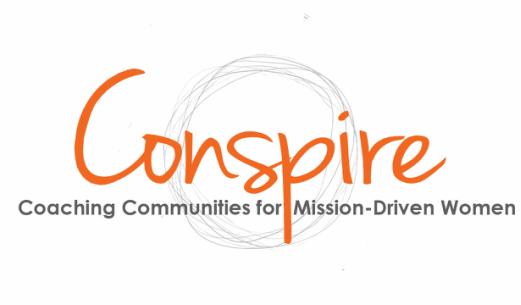 Conspire Alumnae discount: $50 for individual month, $40/month if you sign up for the series. We will follow up with further details and set up auto-billing. It's a new year and you want to make the most of it. Spend a week auditing and observing your time to better understand how you use it, and your relationship with it. Then, with the support of a trained coach and a set of FABULOUS peer coaches, set a time-mastery goal and develop a plan, then get support to develop this mastery. Share a few laughs as we all reveal our time-idiosyncrasies and connect with conspiring women who are seeking similar mastery. Week 2: Get matched with co-conspirators, complete observations, create a plan. Professional Coaching. Week 3: Implement plan with the support and accountability of your co-conspirators. Submit reflections. Professional Coaching. Week 4: Implement the plan with support and accountability. Submit reflections. Closing & certificate of completion. Taking risks is a critical part of career advancement, life fulfillment, and innovation. Yet, many of us (especially women) are averse to risk. This can hold us back from promoting a great idea, making a big career/life changes, advocating for a view, stretching out of our comfort zones. Fear creeps in in big and small ways. Spend a week taking on risk challenges and observing when your fear kicks in and how it holds you back. Connect with co-conspirators who share similar fears and deepen your self-awareness about it with your coach. Set an intention for a new response to the same old fear and use coaching tools to develop the courage and commitment to following through on a risk you want to take. Be fearless in 2016! Week 4: Implement the risk plan with the support of co-conspirators! Many conspire alumnae are strong relationship builders, strategic thinkers and do-ers, but struggle to influence the agenda in our organizations. During this intensive, you'll observe yourself being an influencer in a few different contexts and notice what your natural influencing strengths are. You'll identify an area of your life in which you'd like to develop more influence and work with your co-conspirators and coach to begin manifesting that influence. As a bonus, we'll offer you (free) opportunities to practice pitching and making big asks and get peer and coach feedback. Get ready to push yourself and discover your inner-influencer! Bring spring cleaning to a whole new level. Observe your stuck-spots and identify the areas of your physical and virtual spaces that hold you back from being your strongest-self. Enroll the support of your co-conspirators to help you identify a keystone organizational system to unleash a waterfall of order and serenity. Deepen your awareness about your personal and professional organization with your coach and finish April off with a significantly cleaner slate! You engage with others, both personally and professionally, in some consistent ways. Spend a week observing critical relationships and noticing what dynamic you help to create in those relationships. Then, hone in on one relational habit that prevents joy and connection from emerging in critical relationships. Connect with co-conspirators who are focusing on similar relational habits to discover triggers and protective practices to experiment with. Go even deeper with your coach to tap your inner relationship strengths and close out May with renewed ability to connect joyfully and energetically. This month you'll observe your stress for a week and become intimately connected with your stress triggers. Then, you'll change your relationship with stress by reframing your stress stories with creative writing exercises and story-telling. You'll discover how to make stress your super-power and celebrate your body's response to challenging situation. By July, you'll feel lighter and more in control. How do you balance living with humility with being bold? You'll spend a week being an observer of how much space you take up in different contexts and reflect on whether you wish to take up more or less space within each context. Consider that there are some environments that need you to fully emerge and shine, while perhaps other environments need you to take up less space and be powerful in your ability to hold a space for others. You'll reflect with co-conspirators about humility and space-taking, including how gender and other identity-factors play into it, in different areas of your life. You'll work with your coach to develop clarity and confidence with the balance of space-taking and humility. Having a personal and professional mission allows you to show up anywhere and anytime to spot opportunities to add-value and live your most authentic self. Take part in a series of activities to help you identify a concise mission statement OR (for conspire alumnae) to get back in touch with your mission and bring it back to life. You'll embark on some mission-spotting adventures so you'll begin to observe how your mission can be lived in multiple contexts and reflect on these adventures with your co-conspirators. You'll work with your coach to perfect your mission and/or to uncover what's holding you back from fully living it. You want a spiritual/religious/centering practice but something's not working. You imagine that a regular practice and/or commitment to a spiritual community would serve you well, but feel stuck or stopped (if only partially) in fully engaging. Observe yourself as you attempt to discover and deepen your spiritual practices and commitments and reflect with co-conspirators about your experiences. Work with your coach to develop self-awareness about your inner longing for the groundedness and connectedness that spiritual practices often provide and to find new openings to engage. At Conspire, we identify as intersectional feminists and we are committed to creating spaces in which all women-identified people become supporters and champions of each other. During October, we'll look specifically at the mutli-layered aspects of our identity and become observers of how our layered identities interact with the world around us. If you've wanted to spend some time with your identity as it relates to leadership, professional impact, confidence, in particular, we invite you to be part of this safe space. You'll have a chance to make your observation and give voice to your own truths. You will have opportunities to request non-verbal listening spaces as well as feedback and ideas to figure out what to do with these observations. You'll work with your coach to find the deepest strength in these truths and step into your most authentic self. In November you'll observe how much and how well you champion other women to succeed in their lives and careers and take on challenges to lift other women up. By doing so, you'll also gain opportunities to be championed - have doors opened for you and new connections. You'll embark on a series of challenges, beginning with observation and moving into action and reflect upon these experiences with your co-conspirators. You'll engage in a coaching session with your coach to explore your own style of championing and being championed. Complete November in full sisterhood with talented co-conspirators with shared values and commitments to social change. Close out 2016 by reflecting on the year you've lived. When were you your strongest self? When were you hiding? What were your most meaningful moments? What new inner-knowing did you gain? What will you let go of? What will you hold on to? Who are you headed into 2017? We'll use a variety of media, visual, writing, recorded stories, to playfully uncover the lessons and insights into 2016 and make choices for 2017 armed with reflective wisdom.